Automatic Identification System (AIS) data is now being used to determine the collision risk for offshore installations. MARIN helps oil companies with risk assessments for offshore installations by calculating the probability of a ship collision with the offshore installation. For these calculations, the traffic around the installation can now be modelled using AIS data. In this way, the traffic situation is realistically represented. The Safety Assessment Model for Shipping on the North Sea (SAMSON) has been used and developed for more than 25 years. Several types of risk assessments are performed. The traffic in SAMSON is modeled by a database consisting of two parts, the first of which is a network of links, describing the number of movements per year for different ship types and sizes. This network is based on ship voyages to and from European ports. The second part shows the density of non-route-bound ships but with a specific destination at sea, such as supply vessels, work vessels and fishing vessels. Nowadays, almost all seagoing ships are equipped with an AIS transponder. Although this system was originally developed for collision avoidance, it is also a valuable source of information on ship behavior. AIS data, showing the actual paths sailed by ships, represents a considerable improvement to the SAMSON traffic database, particularly outside the main shipping lanes, where offshore installations are usually located. 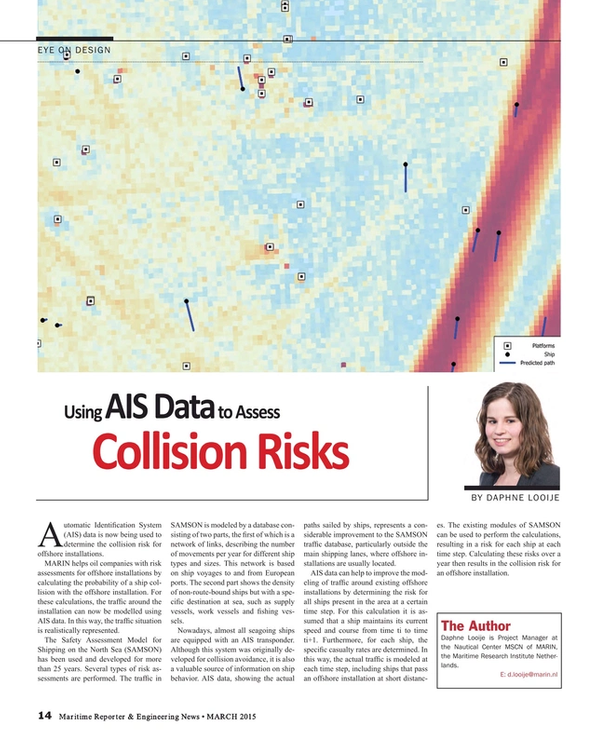 AIS data can help to improve the modeling of traffic around existing offshore installations by determining the risk for all ships present in the area at a certain time step. For this calculation it is assumed that a ship maintains its current speed and course from time ti to time ti+1. Furthermore, for each ship, the specific casualty rates are determined. In this way, the actual traffic is modeled at each time step, including ships that pass an offshore installation at short distances. The existing modules of SAMSON can be used to perform the calculations, resulting in a risk for each ship at each time step. Calculating these risks over a year then results in the collision risk for an offshore installation. Daphne Looije is Project Manager at the Nautical Center MSCN of MARIN, the Maritime Research Institute Netherlands.